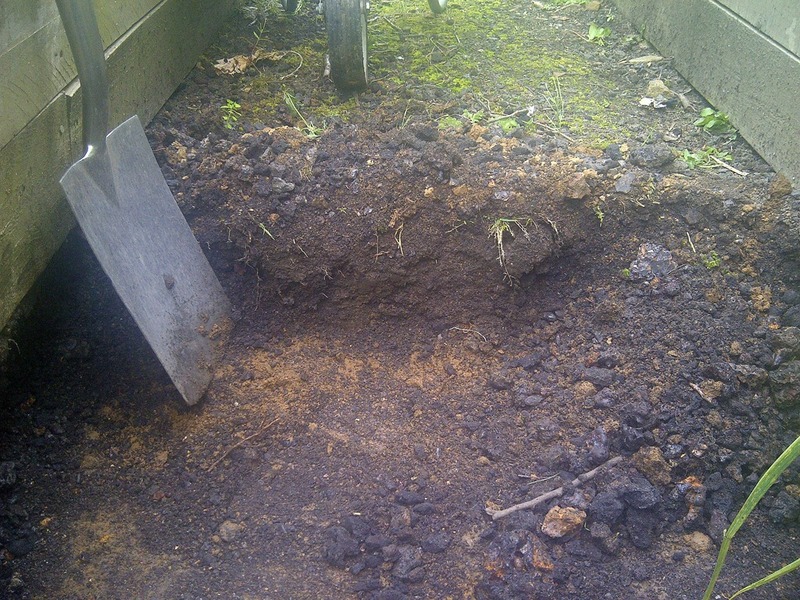 I gave a bit of background about the soil in our garden in a previous blog. 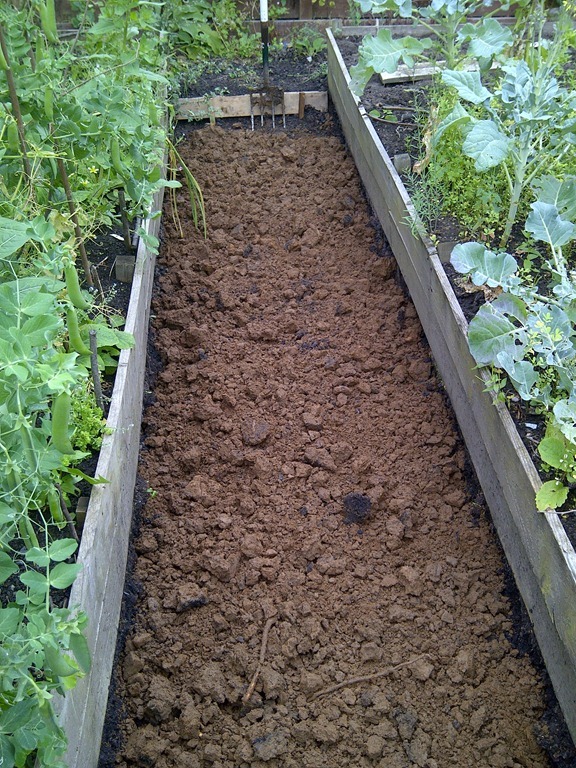 The topsoil in our raised beds is separated from the clay subsoil by the cinder of the old tennis courts which means that the topsoil doesn’t have access to the minerals and soil life of the subsoil. Although we have introduced lots of organic matter and worms to the raised beds the fertility decreases very quickly, we find very few worms if we dig and the soil dries out very quickly. Interestingly, at the edges of the beds where we put some plastic sheet between the wood and the soil and it forms an L shape covering part of the cinder we find that the soil is more moist, we find more worms and other creatures and plants grow better. The cinder seems to act as an almost impenetrable barrier to everything but water, when digging out plants with deep taproots we find that the roots often formed a spiral when they reach the surface of the cinder, the exception being alfalfa (see later). As a result of these observations I decided that it might be a good idea to remove the cinder! This would result in the raised beds being “less raised”, about 15cm instead of 30cm, and a lot of cinder to dispose of. I was not prepared to skip it so we decided to use it on top of the existing cinder paths in the garden, to create some new cinder paths by removing the few inches of top soil that is on the cinder between the fruit beds and also a small pile of cinder to experiment with growing wild flowers on. 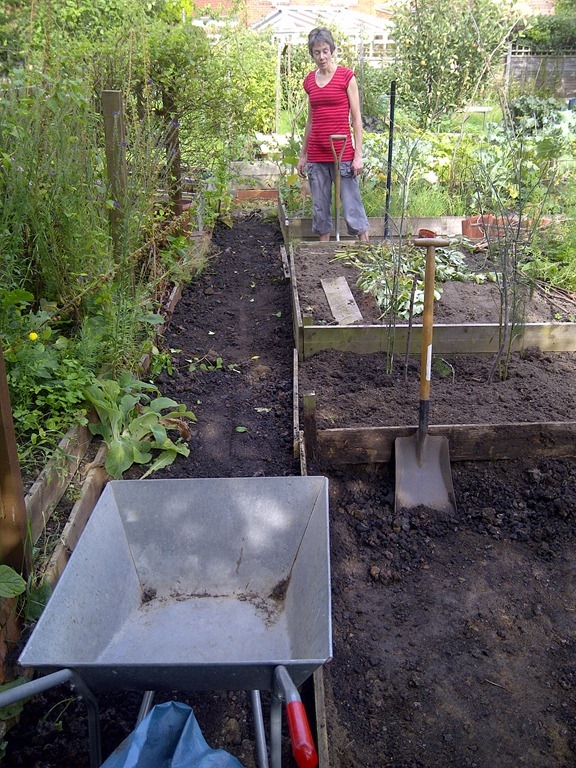 This picture shows one of the paths between the raised beds with the cinder partly removed exposing the clay surface. The clay has a line of stones running through it suggesting some previous feature dating back before the tennis court was built. The clay under the cinder was very compacted, as would be expected, so I dug it over and buried loads of hedge cuttings, bits of twig and other garden waste underneath it at a depth that would not be disturbed if we were to dig the final bed over. Hopefully this will help to maintain air pockets and moisture in the soil and encourage beneficial soil life (see HugelKultur beds). The next stage was to transplant some of the plants, shift soil from the end of one of the main beds into the prepared path section (all three beds will eventually be merged into one large bed), and start shifting more cinder onto the remaining paths around the beds. Here you can see the cinder in the end of the first bed with the clay surface exposed and the path which has now had an extra layer of cinder, this was later rolled to create a harder and smoother surface. 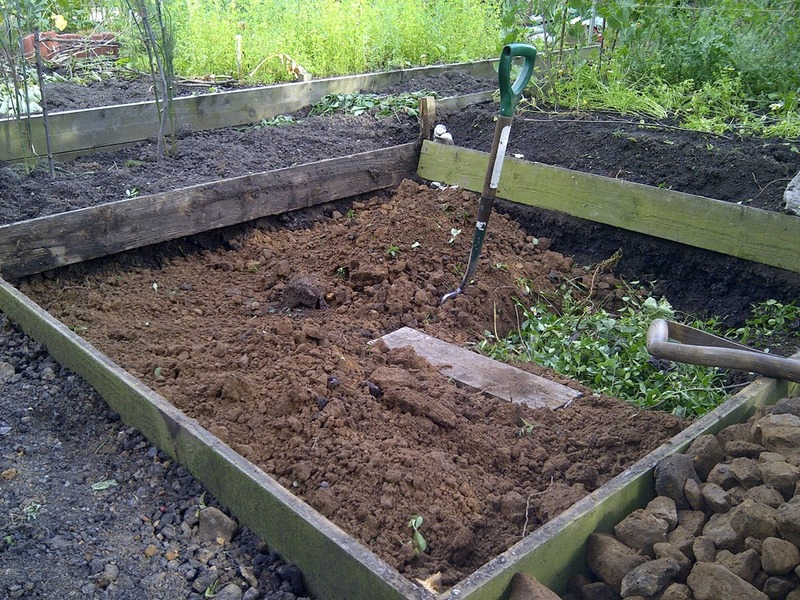 This photo shows the first bed with the clay in the process of being dug over and plant waste being covered over. This bed had a line of stones running through it and you can see the pile of stones in the right foreground. Behind the bed to the left is the path which has already been dug out and filled back in and behind that is bed 2, you can see the original height of the beds and see that the new beds are 15cm lower. When I started work on bed 2 which had been planted with alfalfa as a green manure underneath the main plants I found that their roots went right down to the cinder layer, through it and into the clay, a depth of over 50cm! These roots were really fine but quite obvious. This makes me wonder if, over a much longer period of time, plants such as alfalfa could be used to help reclaim and remediate cinder. Of course, one of the things I am not sure about is what chemicals there are in the cinder. It appears to be the waste from an iron works as there are lumps of cinder which incorporate large nuts, bolts and other metal objects, I therefore assume that it is rich in iron and carbon and hopefully not too many nasty chemicals. At some point I will have to see if I can get the soil in close contact with the cinder chemically tested – does anyone have access to a lab? Where have I got to with this project? At the time of writing I am about 2/3 through the main beds, rain and some plants are delaying the finish. We are about to plant green manures onto the finished parts of the bed and to introduce some compost and worms to one end. I’ll report back at some point in the future as to how successful (or not) all this hard labour has been. This entry was posted in Garden, Permaculture, Soil. Bookmark the permalink.